Lemme just start with this... if you're a creative in any way I'm talking to you. I know, I just know, there have been times when you are working on a project and you've been stuck at some point trying to figure out what color to use next. Just unsure if this color really does coordinate with that color. Or just stood back staring at your canvas, mood board, blanket... whatever it is and you can't figure out what's that next color to complete the piece. These color palette generator's are ah-maze-ing! Seriously y'all, not only are they super-duper helpful but they're also fun just to play around in and if I'm being real honest with you, can easily being a time-sucker. Just beware. 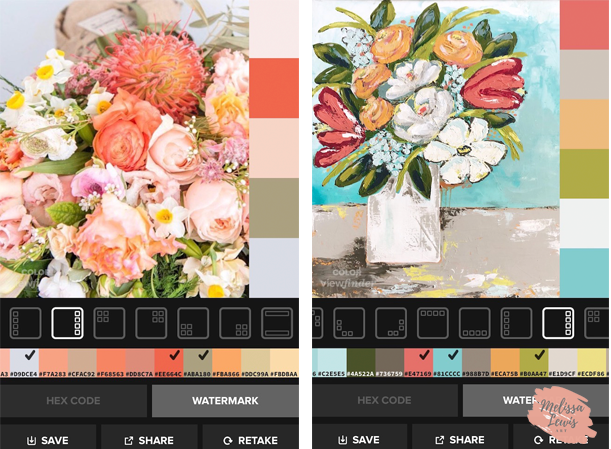 Here are my best five color palette generators that you can find online and even as an easy go-to app on your phone and ipad! Also, these aren't in any order because you'll find after playing around with them that they offer different things. I love them all for their different functions. Okay, okay...maybe this one might be my favorite. It is my first go-to because its easily accessible on my phone and ipad and the extra cool thing about this one is that you can upload a picture from your camera roll and it pulls lots of color choices for you to select. I use this a lot as a part of my painting process. You can see how the Color Viewfinder App so easily would be used for selecting color choices for website designs, wedding and event planning, paintings and illustrations, and really anything under the sun. 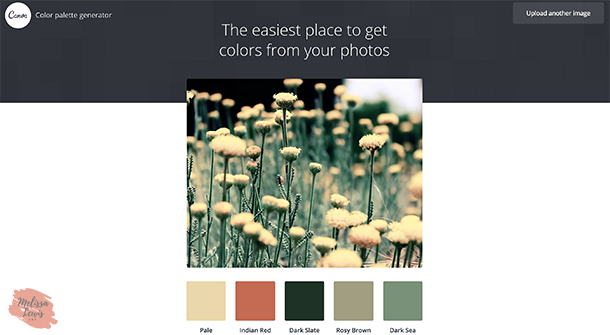 There's an option for you to save this new color palette you've created to your camera roll and head out to the paint store and use this image to find your paints. Or if your using this for any graphic design just copy and paste the Hex Code. It's just too easy! The cool thing about Coolers is its made for iphone, ipad and desktop. Either platform is easy to use. What I like the most about Coolers is the Generate button. On your desktop you simple hit the space bar and new colors are generated. You hit the lock icon to keep what color or colors you like and hit Generate again until you have all five of your perfect colors. An additional cool factor for the Coolers color palette generator is you can explore so many other people's already made color schemes for your own inspiration. This is a pretty nifty tool for all creative type folk to have in their back pockets. Color Lisa is just my jam y'all. Can I still say "jam?" I think I may have just exposed my old age and non-hipness, but it really just is. One of my favorite courses in school was Art History. I am a person who just loves hearing the stories and the little details behind all the things. So I just soaked up all that information about Monet, Van Gogh, Rembrandt, Picasso, etc. And this website just has it all. If you want some genius inspiration, this is your place. The downside to this one is that it doesn't have an app. But who cares really? Open up Safari on your phone and go to town. But be careful, it's easy to spend an hour here and only think it's been fifteen minutes. You guys! Did you even know about this? I literally just discovered Canva offered this as an option. I'm still playing around with it so I don't know a lot about it yet... but Canva now offers you an awesome little color palette generator tool in addition to all the other awesome stuff Canva gives us! I can't see how to get to it on the app yet, only on their website. However, my fav feature yet again is that you can upload a picture from your camera roll and have your own color palette. There isn't a "generate" button to allow you to select different color options, but this is still a pretty amazing tool to have while your creating your nifty little image with text for your blog, Instagram or Pinterest. You just hover over the color you want to use in your design and select Copy. 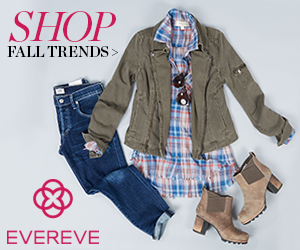 From there you can paste that number into your color options of your design. So fast and so cool. Thanks Canva for this amazing feature! There you have it. My favorite four free online color palette generators for creatives! There are more out there for sure, but these are my go-to's that I spend the most time in and find the most helpful. 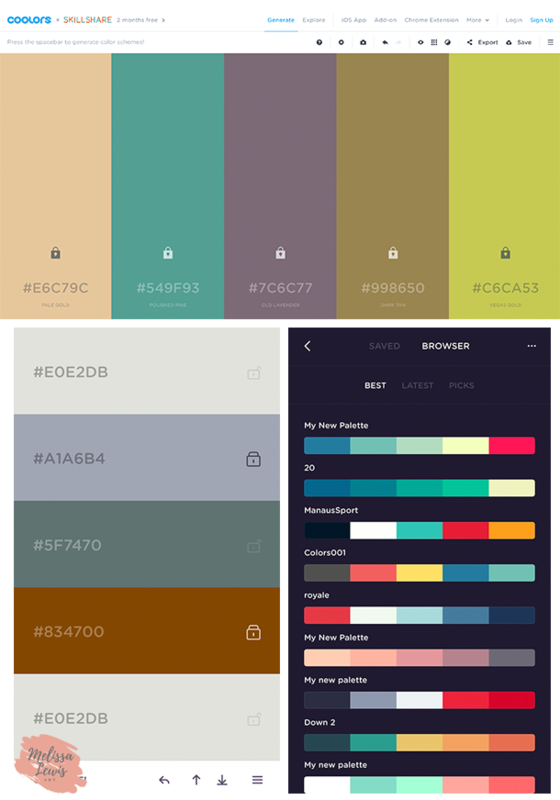 Have you used a color palette generator before? Let me know in the comments what your favorite is! If you found this helpful Pin this picture below!